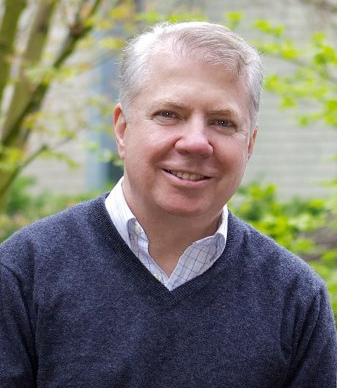 You can read full coverage of the event on Mayor Murray's blog. I believe there is a need for greater transparency and consistency in providing information and soliciting input from community leaders. That need is becoming more apparent each day. When I am out in the communities throughout the city, I hear time and time again that people want to feel valued, listened to, and acknowledged. At a recent community meeting someone asked "Why can't the city connect with us?" It's a good question and one that is worth pursuing. Through our online survey, we learned that one of the things we can do to show that we value our neighborhoods is to listen. When asked what we can do to be more effective at solving problems, we heard that we should more attentive, more responsive and use the input we gather from our residents. And when asked what one thing we could do to change the relationship between the city and our communities, responsiveness ranked high on the list. This input has been valuable and is helping us shape our Neighborhood Summit. We need to repair our relationship with our neighborhoods. Engaging residents to determine community values and priorities is a continuing process, and the Seattle Neighborhood Summit is the first step for my administration. I ask you to join us, take a seat at the table, and join the conversation. Diane Douglas from CityClub will discuss the recently released Seattle Civic Health Index report. The report finds Seattle's civic health to be excellent, but there are key areas where we can improve, specifically in connection and trust. We will touch upon how we organize as a community and as a city. Every community in the city mobilizes differently and for different reasons. With the recently passed district elections, community organization and government will look different. Infrastructure is an issue of city-wide interest. Share your thoughts on transportation as we embark on a search for a new Director for the Seattle Department of Transportation. Participate in a community discussion about the transportation needs of the city. Curbside Consulting: Access city resources in real time. Sit down at a staffed table and sign up for services such as utility discount programs, small sparks grants, or get a library card right then and there. Department Representatives: Share your thoughts and ask questions of staff from city departments. Getting social: Demonstrations of social media and technology that allow people to participate in new ways. If you can't make it out to Seattle Center for the day, check out what's happening via our live coverage page which will include a video stream of the event, a frequently updated blog, and a look at the conversation happening via Twitter. Here's a full rundown of what you can expect at the Neighborhood Summit. There are many opportunities to help. If interested, email us or call Kathy Nyland at 206.684.8069. 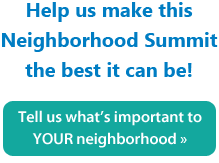 Fill out our online survey to let us know what you would like to get out of the Seattle Neighborhood Summit and what is important to your neighborhood. To learn more about the Seattle Neighborhood Summit, check back here regularly. You can also email SNS2014@seattle.gov or call Kathy Nyland at 206.684.8069. Saturday, April 5th - 9:00 a.m. to 1:00 p.m.